There was strong cultural resistance to it within TVNZ management though – and Charter programming was often ghettoised in the schedule. Additionally, one or more purely public interest channels should be established. This is basically what we used to have with TVNZ 6 and TVNZ 7. Channels where the objectives are different. Where programming can be more niche and specialist. Where there are no concerns about advertiser conflicts of interest or commercial ratings. By the end of the whole saga my feeling was that public service channels didn't sit well within a commercial operation. There were simply too many interests and objectives in conflict. Every viewer who watched TVNZ 6 or 7 was a viewer lost to commercial television – which is why you literally never saw a promo for a 6 or 7 programme on TV One or TV2. They couldn't afford for their public service programming to do too well. Similarly, TVNZ’s non-commercial channels TVNZ 6 and TVNZ 7 never managed to attract significantly large audiences. Heh. TVNZ 7's audience by the end was, of course, a matter of great debate and considerable misinformation – but in December 2011, Nielsen assessed a monthly cume of 1.47 million, which isn't bad. But, as noted above, 6 and 7 benefited from the skills and infrastructure of the mothership, but never actually got to leverage the reach of One and 2, because they were never exposed on those channels. This would get around the key problem of the Charter era – the dual remit imposed on TVNZ by the government: make money for us and do good things. Public service broadcasting would be funded by all commercial broadcasters. Mediaworks, NZME, Sky and others would all be charged some form of license fee or operational levy for the right to broadcast commercially in NZ. That revenue would form a fund for all public broadcasting: Radio NZ, TVNZ’s public service operations and Maori TV. And in a nice bit of timing, The People’s Commission on Public Broadcasting and Media launched this morning. It’s backed by ActionStation and the Coalition for Better Broadcasting. The panel appointed is quite impressive. And there will be pubic workshops around the country. I doubt there's any perfect solution to this... Ideally we'd have had a true public broadcaster for the last 50 years and it would have grown and developed in the way the BBC and ABC have over that time. I think TVNZ probably struggled with mixed messaging from the government on this. While the charter was in place they were still expected to deliver a dividend to the government. If they instead became a self-funding mixed model where income was reinvested it would seem that there would be less conflict. Obviously it would also be necessary to infuse management with supporters of the idea, and create a cultural shift. My experience, working within TVNZ during the time TVNZ 7 operated, was that staff and management were generally supportive of the channels, but there were obvious difficulties in terms of objective conflicts. TVNZ 7 didn't have that long to develop and, as you noted, it wasn't necessarily given the exposure it deserved. The main reason I think a mixed model would work well is that it would preserve the huge audiences TVNZ has, allowed them to be reached with suitable content, while non-commercial channels would be able to screen other material that might not fit on the commercial channels. If we were to sell TVNZ and start again then all we get is the non-commercial channels. We have no ability to ensure content be placed on high viewership channels, and we have no opportunity to cross promote into a the high viewership channels either. To my mind the idea of making TVNZ do both is the best of both worlds - we'd get a "proper" public broadcaster that was able to share resources with the the existing TVNZ operation. Commercial operation would directly and indirectly subsidise non-commercial operation. Well yes, perhaps. Although the license fees they pay are pretty tiny given the revenue generation they enable. But even so, perhaps simply redirecting those existing fees to a public broadcasting fund would be a good start. "Charter-style public service considerations should be reintroduced with a certain amount of airtime devoted to meeting public interest needs." We already do this at Face TV but we're stymied by the inability to get a free Freeview frequency for non-commercial TV (we are on Sky TV only for that reason) and its resulting inability to access NZOA funding. Freeview is a monopoly by Kordia, another SOE charged with returning the highest dividend to government and without a public service charter. Often when we have these discussions people think only in terms of investigative journalism (this seems to be the case with Gareth Morgan) or academic documentaries. But public service broadcasting is more than that. It’s seeing ourselves and our culture reflected on screen – this has been NZ On Air’s objective, and with opportunities to do the same thing but without commercial pressures we can deliver even more of that. Funding can help to get programmes made (if not necessarily shown, or reasonably scheduled). But I despair less at what TVNZ doesn't show (after all, I got interwebs, and can retreat to my liberal island), than what it does show. It's not the absence of quality documentaries so much as the presence of Sensing Murder and the network's ongoing obsession with Bad Brown People (OK, that may not be the official title but it covers Renters and all the other peak-time stuff that appears designed to reinforce prejudices - most nights of the week). As always with these discussions, Morgan et al make a good case for things they would like to see, but focus on the hypothetical rather than the real, because they never watch what is actually on. It's like the discussions on political coverage: while campaigning for better Sunday mornings, worthy commentators miss the politics that infests everything from Radio Sport to FM breakfasts. And if you say "Never mind Q & A, what about The Bachelor", they say "Oh, I never watch that rubbish". So while battles are fought for the margins, the war is lost. Not entirely facetiously, I suggest the panel commit first and foremost to watching all the things they would never want to, so they can witness "ourselves and our culture reflected on screen", as experienced by a large chunk of the population. And all MPs should be strapped into chairs with no remote, until they have learned what they have wrought. I'm curious about how streaming TV has changed the landscape on all of this. My experience over the past 3-4 years is that I have watched more great TV on Netflix than I ever did on broadcast. Partly that is because the programming is wide open - 40yrs + or - of tv programmes to choose from. Being our own programmers is attractive as is being able to serially watch without any advertising has transformed TV into something we like. I'm probably a minority audience but it has made broadcast TV pretty much unwatchable with its high percentage of dross and interruption style thinking. I did watch TVNZ7 when it was on and it seemed like a good idea at the time - however with the conflicts of interest between various parts of TVNZ I can understand why that didn't work. I have spotted a channel on Freeview called Duke which seems to be some kind of TVNZ experiment. It seems like with the Freeview setup it should be easier to launch some other PBS style channels there and have them run by an experienced team from TVNZ. It seems like "public service" programming could be made to work if the obvious conflicts of interest were removed. I did read somewhere that the total of TVNZ dividends was approaching $100m. Not sure how many years that represented but surely some of that dividend stream could finance a PBS style remit? As well as this, we should be looking at refreshing the Free-to-air Television Code. It is not enough that television shows simply be 'balanced' and 'accurate'. This works fine on an issue-by-issue basis, but not when taking the news stream as a whole. The problem is that broadcasters (particularly commercial broadcasters hoping to sell wealthy audiences to cashed-up advertisers) can choose to simply ignore issues wholesale, obviating the need to be balanced and accurate. The best example would be the depiction of organised labour. The media does a passable job of providing a balanced and accurate depiction of union-related incidents on an issue-by-issue basis, for example when there is a negotiation or a strike, and the unions can come off a bit angstey (because that is how they are almost always portrayed in the media), but there is no requirement for news outlets to broadcast stories about things like when unions work with employers and develop more efficient systems like lean manufacturing or successfully advocate for wage rises for their members. This is because they are not required to. Not just labour, but many aspects of society are ignored or portrayed in a certain way that plays well with advertisers. Perhaps a re-jig of the journalism/media/broadcasting codes could end with a more specific set of requirements, something like that they are required to compulsorily report on (in a balanced and accurate way) a few, or several, aspects of civic life that are important to people (like how much they are being paid). This would result in a much more balanced and accurate overall news stream. Broadcast TV is pretty much obsolete technology - looking at a clean sheet of paper, why would you spend millions on a dedicated radio pipe to do the same thing as near free internet bandwidth? Of course it will have a long tail, but eventually (I'd give it 20 years, max) TV3 will switch off and then there will be a question of how long the government keep TVNZ on life support. First of all, Gareth Morgan's rambling on public broadcasting simply confirmed to me he is just another in our lamentable history of somewhat to very odd millionaires feeling obliged to favour us with their brilliance via some sort of political vanity project. Viewing figures of free to air TV would tend to indicate reports of it's obsolescence and death are premature. I guess you keep dirty public broadcast services because an important function of state broadcasters of record is their role in disasters, and radio and broadcast TV are relatively robust in the face of disaster. When the aliens attack no one is going to tune their emergency pack transistor into the afternoon crew of Inane Rock FM. 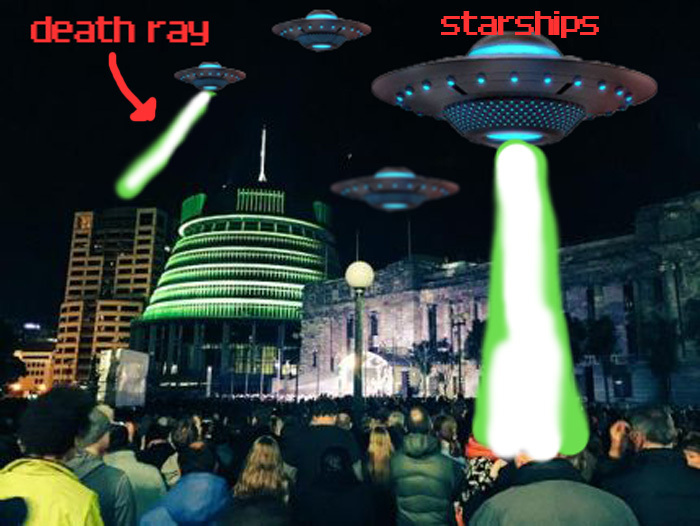 They'll be going to Radio New Zealand, which will still be on air and broadcasting from Wanganui using a bit of wire, a car battery and a 1930's transmitter that no one got around to replacing long after Wellington or Auckland's ISPs were vapourised in a big hit from the orbiting starships death ray. But if we accept that free to air broadcast services are going the way of the Dodo, then it raises questions around the current model of access to online services. At the moment the access "pipe" is controlled by private ISPs. But if access to the internet becomes the only way to gain information on key parts of civil society, should we consider nationalising the ISP's and providing access for free and only charging for content (i.e. break net neutrality with a public good argument)? Or perhaps the state should compel all ISP's to offer free access to any device to access any website on a white list, for example - any website that ends in .govt.nz? This would give a powerful inbuilt advantage to state websites, should the government re-create state media on the internet as, say, tvnz.govt.nz. Great discussion, thanks for posting Dylan. In my opinion, this debate needs to be seen in light of anti-siphoning plans, as well as looking at hybrid models. Regarding the latter, there's a case for having TV1's linear feed as an ad-free public service broadcaster, but with sponsorship allowed. Catchup and streaming can remain commercial (revenues here are currently low, but will grow). Sponsorship + steaming revenues can be used to develop non-commercial programming. This gets around the (real) problem of shoe-horning a public service broadcaster into a commercial operation. For clarity, I'd keep TV2 fully commercial. In terms of anti-siphoning - its a real possibility that in the not too distant future the likes of Sky will be outbid for big ticket sports rights by the likes of Facebook, Snap, Apple etc. This I think opens the door for the govt to enact similar rules to Aussie, & legislate for major sports events to be shown on free-to-air. How? digital and streaming rights carved out for VodaSky or international giants, linear rights sitting with TVNZ - who would also be able to monetise through selling on air sponsorship. Clear as mud? I often thought the solution would be to keep TV2 as it is, and make TV1 the ‘public broadcaster’. It has a huge audience from the get-go, and you could even *possibly* keep it commercial, on the understanding that revenue (and therefore ratings) aren’t the driving motivation on that channel. Hire a CEO, senior management, commissioners and programmers on the basis of vision and commitment to high quality programming, not just in news and current affairs but also drama and the like. That makes sense. You couldn't get there with existing management hired to do very different tings. I think these days you could ditch the Freeview infrastructure required for TVNZ6 and 7 with an online-only offering, but one that has mandatory promotion in places where people will find out about it, i.e. 1, 2, one news website etc.. I found out myself the hard way about what happens to an online-only show at TVNZ when they don’t bother promoting it (it dies a death). But the Freeview slots are there – they're just being used for +1 channels and Duke. I'd argue better uses could be found. Although to really reach a mainstream audience you need to be on Sky as well. Which is where a Must-carry-must-pay rule as seen in other countries could come into it. I said it had a long tail but that doesn't mean it'll last forever. And as Netflix and other things take the viewers away, revenues are falling, which means content budgets are falling, which means content gets worse, which drives viewers to Netflix. TV1 as the public service and TV2 as commercial works for me too. Although I'd personally keep both as basically-commercial. Perhaps give each channel slightly different objectives in terms of public interest content quotas and style. As long as the management was on board with the vision then I think any reasonable mixed use structure could be managed. But the infrastructure already exists - there's no real benefit in not using it. The barrier to entry for viewing it then is exceptionally low - everyone can watch it with no real effort. People can stumble on it. The other thing I think I'd promote going forward in this model is TVNZ getting public interest content on as many platforms as possible. That could mean, for example, licensing some content to Netflix and others for minimal cost simply on the basis that availability is the goal. Yeah, I read through as much of yesterday's thread as I could a while ago. In it Gareth comes across as a bully who isn't well informed about the subject. Okay point taken from you and Russell both on that one, I guess it depends on the extra cost from actually programming and operating those freeview channels - putting together a schedule, producing links and teasers and all that stuff isn't quite as low cost as putting shows directly online. Those costs aren't super high. And I think would be worth it for added accessibility and reach. I believe TVNZ7 used to run a 6- or 8-hour schedule that was repeated over 24 hours. That's the way many channels operate. As for promos and the like - I worked with TVNZ promos a lot when TVNZ 7 wrapped up - there wasn't much obvious difference in overall workload for producers between across the transition. Those departments already produce a lot of material, and have in built flexibility to be able to adapt to changing schedules. Scaling up isn't hugely demanding. I’m curious about how streaming TV has changed the landscape on all of this. My experience over the past 3-4 years is that I have watched more great TV on Netflix than I ever did on broadcast. *Put hand up*. Same here. The change of media landscape driven by technology needs to be factored in when it comes to what to do with TVNZ. RNZ is an interesting case IMO, because they have evolved with technology, and they have a wide variety of programmes. Not glossy TV programme with fancy graphics. Just a voice on the radio or a podcast talking about local issues. They use technology to reach a larger audience than they would otherwise reach only with radio. They are a public broadcaster already, just with a smaller scope. So why not just give them a bigger budget and task them to reach a even wider audience? I agree that local programming is more than just journalism, so TOP’s focus is just too narrow. So what exactly do people want from a public broadcaster that reflect NZ culture in the first place? More Masterchef NZ? The Block? Shorty Street? Can someone provide some concrete example? You look at BBC, they do everything under the sun, from nature doco to Doctor Who. They even commissioned Top of the Lake. Are we expecting a NZ public broadcaster to do THAT kind of range? Thanks, Russell. The Coalition for Better Broadcasting is changing its name, to reflect a wider interest in all aspects of media but it is not happening immediately (I am an elected trustee of CBB). The venture with Action Station is an outcome of shared interests and I am looking forward to it generating good debates and goid outcomes. In the meantime, the conversation here. is pretty damn good. Like all simple ideas, Morgan's declaration has simplistic appeal. But it is also half-baked and solipsistic. As others have commented above, television is about much more than journalism. Radio NZ have once again been exceptional covering today's Chch wildfires. Mind you, it was TV3's Hamish Clark who earned awards for his immediate post-eqnz footage. I used to think so too, but when I moved house last year we decided not to go getting MySky again (yes, I know it's broadcast, but it's also timeshifted and you can basically skip ads) and I haven't found Freeview nearly as burdensome as I'd thought. If I'm dying I can download something, but for the most part vegging out watching what millions of other people watch has actually felt less isolating than all the picking and choosing and obsessing about not watching ads. Hell, my attention to what isn't ads is pretty low anyway, considering that I've got the net in my pocket at all times, and I'm pretty much reading during every show anyway, looking up only for those moments that they promise 7 times in the hour and then finally deliver in the last 10 minutes. ZOMG, he's gonna tell her he's a stripper! ZOMG, the dessert collapsed! ZOMG, Trump's brainfarted in 100 million faces again! OK, back to some long article the lazywebs found me.